The Maldon Market features specially selected stall holders from the creative and fertile heart of Victoria, as well as emerging Melbourne talent. From soap to soup, fruit to furniture, plants to pants, jewellery to jumpers, the Maldon Market has something for everyone. 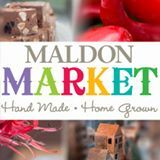 With a passion for grass roots creativity and quality products, the Maldon Market provides visitors the chance to meet the dedicated makers, bakers, sewers and growers behind the exciting range of things the market has on offer. Located in the historic goldfields region between Castlemaine and Bendigo, Maldon provides a peaceful country market atmosphere that the whole family will love. Spend the morning at the market and the afternoon in the town and you will have the perfect day trip to Australia's first National Trust classified town. Better still, come on Saturday and stay in some of the quirky, quaint or simply beautiful accommodation and make a weekend of it! Maldon is Calling - Maldon Market from Archivist Media on Vimeo.